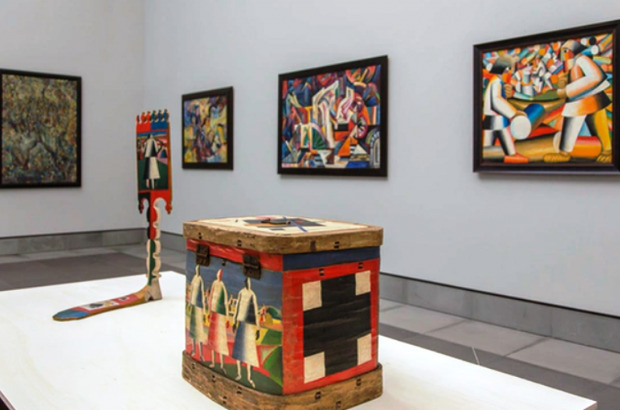 From Flanders Today: In the latest development in the situation of 24 works of Russian avant-garde art on display at Ghent’s Museum of Fine Arts, judicial authorities have carried out a search of the museum, as well as the home of the owner of the collection. For months, experts have claimed that many of the artworks are fakes. The owner of the works, Brussels-based art collector Igor Toporovski, has started a non-profit organisation to put the works – and more – on permanent display in the Brussels municipality of Jette. But first he loaned them to Ghent’s Fine Art Museum (MSK). Because of a recent spate of fakes discovered in the world of Russian modern art, international dealers took an interest in the pieces – mostly paintings but also sculpture. Several even travelled to Ghent to see them in person. The works are by pioneering artists of the period such as Kazimir Malevich, Wassily Kandinsky and Vladimir Tatlin. In January, 10 international dealers and curators penned an open letter, published in local media, calling into question the authenticity of “nearly all” of the works. The museum’s director, Catherine de Zegher, said that all the paperwork for the works was in order. When questioned by city councillors, she said that the works had been examined by two experts in Russian avant-garde art before being put on display. Flemish culture minister Sven Gatz, however, ordered an independent analysis. He assembled a team of four experts and brought them to Ghent to work together with the Royal Institute for Cultural Heritage to determine whether or not the paintings and sculptures were authentic. In the meantime, the museum decided to dismantle the exhibition. De Zegher told De Standaard that she was deeply disappointed that the experts could not make a determination, thereby clearing the MSK of any wrong-doing. “It’s really a shame that it ended up this way,” she said. Earlier this month, the city council suspended De Zegher, saying that the experts who she claimed analysed the works before they were exhibited in the museum denied any such co-operation. The city has asked the director to provide proof that the experts were called in. It has also sent auditors to the museum to examine the procedures involved with curating exhibitions. Finally, in the latest news, this week police carried out a search of the museum, sealing the depot where the works are being stored and confiscating documents and computers. According to information obtained by De Standaard, Toporovski’s home in Brussels was also searched as were two other locations not divulged by the authorities. Although judicial authorities had not been involved previously, they were forced to respond to a complaint filed by a group of four international art dealers who claim that the entire situation has disrupted the art market, affecting their business.